Jeremiah Program began in 1993 with a founding vision to provide supportive housing and services to break the cycle of poverty for single mothers and their children. The program includes two campuses in the Twin Cities and has recently expanded with locations in MA, ND, NY and TX. Jeremiah Program offers one of the nation’s most successful strategies for transforming families from poverty to prosperity two generations at a time by fostering an environment of learning and support for both mother and child. 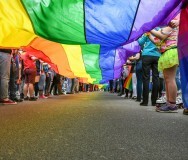 Studies about the effectiveness of the program have shown successful results for both generations, further reducing the generational dependence on public assistance. For every 100 graduates of Jeremiah Program, society receives net benefits of nearly $16 million. 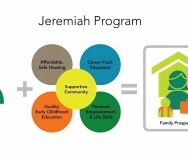 Every $1 invested in a Jeremiah Family can return up to $4 to society through first-generation benefits of decreased dependence upon public assistance and increased taxable earnings, plus second-generation benefits of increased lifetime earnings/taxes paid and savings from costs associated with crime and special education (Wilder Research 2013). Support for Career-Track Education: Each woman is required to be accepted to and enrolled in post-secondary education program upon residency in the program. Program staff works directly with educational institutions to assist in guiding participants in a choice of career and academic program. Early Childhood Education: Jeremiah Program’s Child Development Centers provide convenient, consistent, high-quality, early childhood education for children from infancy through age five. Jeremiah Program surpasses State of Minnesota teacher qualification standards. The CDC’s utilize the acclaimed High/Scope curriculum as well as the Ages & Stages Questionnaire to guide and evaluate childrens' development. The Center provides meals to children, including breakfast, lunch and afternoon snacks. All meals meet USDA’s nutritional guidelines. Safe, Affordable Housing: Jeremiah Program meets the need of single-parent families for safe, stable and affordable housing. Residents live in independent, fully furnished, 2-3 bedroom apartments in a campus community that features controlled key-card access, 24-hour security monitoring, community and meeting space, on-site Child Development Centers, playgrounds, laundry and computer and internet access. Residents pay for utilities in addition to no more than 30 percent of their income for rent, averaging $135 per month. The Minneapolis campus (39 apartments) is located on the edge of downtown, near Minneapolis Community College. The Saint Paul campus (38 apartments) is located in the Rondo neighborhood with access to transportation to several post-secondary schools in Saint Paul. Supportive Campus Community: Women encounter — and build — a supportive community at Jeremiah Program. The network of staff, volunteers and fellow residents provides an alternative to destructive social environments and unhealthy relationships. Empowerment Training: In partnership with Twin Cities RISE! (TCR), Jeremiah Program participants are introduced to the life-changing principles of Personal Empowerment. Participants are required to complete 16 weeks of Empowerment training during the pre-admission to residency process. Life Skills Education and Coaching: Volunteer facilitators with specific expertise work with residents in weekly “Life Skills” education sessions. The unique curriculum focuses on parenting and child development, health and wellness, career development and economic independence. Employment Readiness: Residents are required to engage in career development activities — including volunteering, internships or paid work during their tenure at Jeremiah Program with the ultimate goal of obtaining career employment at a livable wage with benefits upon graduation. Through Jeremiah Works!, residents focus on employment readiness and access employment opportunities with corporate and community partners.